Mountain Time Arts is a public art organization of Gallatin County generously funded by the ArtPlace America Creative Placemaking Fund. MTA was one of twenty-nine projects selected out of 1,400 applicants for funding. It is spearheaded by artist, curator, and producer Mary Ellen Strom; artist, architect, and conservationist Jim Madden; and art and cultural historian Dede Taylor. Residents are likely familiar with Mountain Time Arts’ debut of July 2016, in which it produced FLOW, an evening exhibition by Mary Ellen Strom that projected video about the role of water in the county onto Story Mill grain elevators. FLOW’s intention was to unite residents and locals in discussion and celebration of freshwater sources and heighten awareness of how these sources require continual conservation and care. 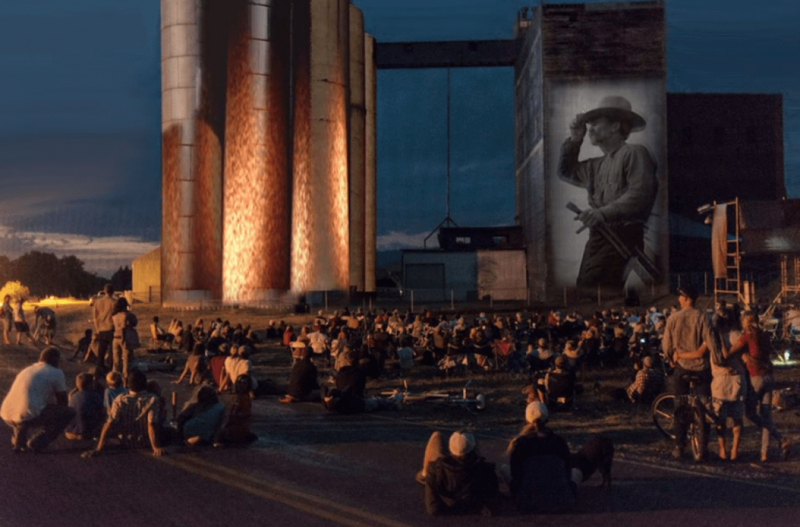 “Water Works” will continue in this vein on an even larger scale via art installments, tours, discussion, and performances ongoing throughout the summer in Bozeman. It will involve the input, reflections, and support of those culturally, artistically, and conservationally concerned with the Gallatin Watershed, including artists, historians, farmers, naturalists, Native Americans, elected leaders, agriculturalists, designers, and conservationists. Historically, native residents of Montana flocked to Gallatin County, revering it for its abundance of food and water: “everything you needed for a good, fat life,” language and cultural historian Caroline Old Coyote states. The city of Bozeman, located in the Headwaters of the Upper Missouri Basin, relies now on a finite water supply, which is projected to decline over time due to Gallatin County population growth--presently at three percent--, changes in precipitation, and increasing drought cycles. “Water Works” aims to cultivate awareness of such a decline, beyond agricultural and conservationist communities. The event begins on June 16th with “Upstream,” which entails window exhibitions on Main Street of artwork by regional artists and local, informative tours of Bozeman Creek. The window exhibitions are meant to inspire pedestrians to meditate on their relationship to water. Featured artists will include Isabel Beavers, Andy Behrle, Dalton Brink, Alexander Clinthorne, Jenny Hale, Gesine Jansen, Brian Petersen, Kathleen Rabel, Wendy Red Star, Kelsie Rudolph, Caroline and Michael Running Wolf. On June 23-24, Joanna Haigood & Zaccho Dance Theater will present Spring Thirst at Bogert Pavilion. “Water Works” will next produce “Cattail,” a series of tours of wetlands adjacent to Dry Creek School in Belgrade from July 21-30. It will culminate with “Gabriel Canal,” which will consist of artist Mary Ellen Strom’s Illuminating Ditches and tours of local irrigation systems that will seek to honor work of local ranchers and irrigators. “Water Works” arrives at a time when convergent concerns about heritage, conservation, and funding of the arts are especially urgent. State-specific as it is, the exhibition resonates on a national and global scale. While FLOW introduced residents to the sway and importance of water in Gallatin and Montana lives, “Water Works” demonstrates that water is art and element, both undeniably crucial to existence on earth.